Canada: Home? What Happened While I Was Out of Town? I will have been in the US for a decade as of July 27 2009. 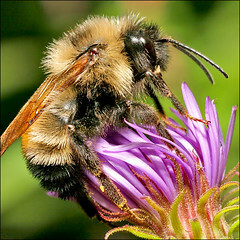 The first move saw me take my family 1,000 miles south to the Bay Area and then 3,500 miles east to the Boston area. When I left Canada, I always assumed that my stay in the Excited States would be short. I was in the country to learn, grow, take advantage of the experience that the giant next door would give me. Then we would return to Canada and settle into a quiet life. Ten years on, I have a Green Card (don’t ask about that nightmare) and when I come home to Canada, I realize how far I have wandered from the country that I still refer to as home. Add to that the fact that most of the visits we make are to one of the fastest growing and most expensive cities in the country and every trip out to places I once knew brings ‘Where the hell did that come from?’ moments. I wax nostalgic for this place, this city near the mountains, surrounded by the sea. It is the city of my young adult life, where I learned the skills I needed to get on in life; where I met my wife; where I felt at home. What a difference ten years makes. We have placed our roots in another place, a very different place. A place that couldn’t be more different than here. I joke that I am legally prevented from voting in two countries. As a transplant I will never be completely at home in the place where I live. The country of my birth is an interesting and lovely place, a stranger that I rediscover a little bit on every visit. When we travel back to the country of my birth, I realize that the move to the US saved me, saved from being trapped by narrow goals and shortened horizons. But the move came with a price. As someone who lives with a gardener, I know the value of a plant in the right place. Often you don’t discover that a plant is in the wrong spot until you have had it for a few years. Then, one season, you transplant it, and, with some more sun and a little more water, it blossoms, it thrives. The gardener who does that is always pleased with the results, but is frustrated by the time lost by having a wonderful plant fight for life, wasting its its energy and effort to survive rather than to thrive. To thrive, I had to leave. But I left a piece of me behind. This week marks a momentous time in the history of the Internet. 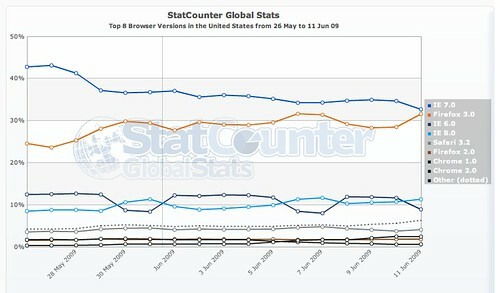 In the United States, StatCounter reports that for the first three days of the work week (Monday – Friday), Internet Explorer 8 usage is equal to Internet Explorer 6 usage. Tie this to the trend of decreasing Internet Explorer usage noted late last week and the release of Firefox 3.5 RC1 and Safari 4.0 and Opera 10 in the last few weeks, and it appears that the balance of browser usage on the Internet is becoming more fluid. Does this mean that standards will become more relevant? Can you truly count on limiting customers to one browser? Will browser lock-in for certain applications continue to be considered acceptable? I have been monitoring this trend for a couple of weeks to see if it remained constant, and it appears to be a real thing. 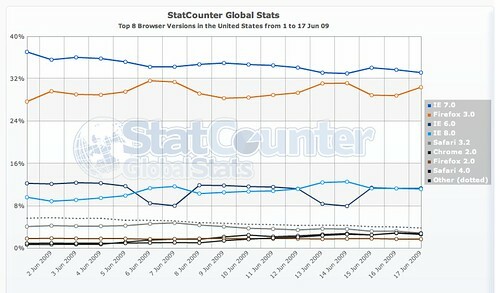 Since the end of May 2009, Internet Explorer 7’s browser share in the US has collapsed, with a requisite increase in the use of Firefox 3.0. This is a staggering change. Either this is an artifact of the way that StatCounter is capturing browser data or a very large organization(s) suddenly switched the default browser that it allowed its customers to use. Does anyone have any insight into why this may have occurred?